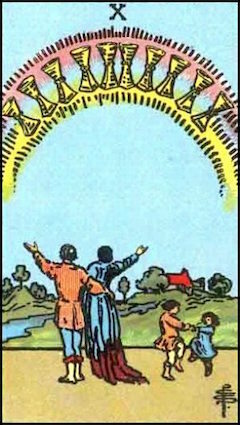 These cards are attributed to Malkuth. Here is the end of all energy; it is away from the "formative world" altogether, where things are elastic. There is now no planetary attribution to consider. So far as the Sephira is concerned, it is right down in the world of Assiah. By the mere fact of having devised four elements, the current has derogated from the original perfection. The Tens are a warning; see whither it leads-to take the first wrong step! 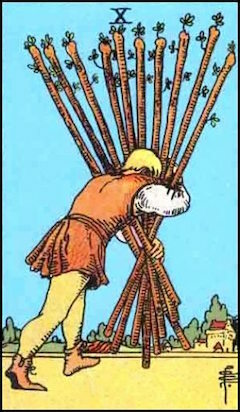 The Ten of Wands is called Oppression. This is what happens when one uses force, force, and nothing else but force all the time. Here looms the dull and heavy planet Saturn weighing down the fiery, ethereal side of Sagittarius; it brings out all the worst in Sagittarius. See the Archer, not shooting forth benign rays, but dealing the sharp rain of death! The Wand has conquered; it has done its work; it has done its work too well; it did not know when to stop; Government has become Tyranny. One thinks of the Hydra when one reflects that King Charles was beheaded in White hall! The Ten of Cups is called Satiety. Its attribution is Mars in Pisces. The watery sign has sunk into a stagnant dream, but in it broods and breeds the violent quality of Mars, to putrefy it. As it is written: "Until a dart strike through his liver." The pursuit of pleasure has been crowned with perfect success; and constantly it is discovered that, having got everything that one wanted, one did not want it after all; now one must pay. 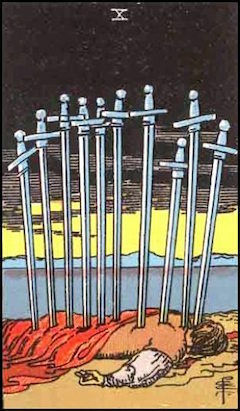 The Ten of Swords is called Ruin. It teaches the lesson which statesmen should have learned, and have not; that if one goes on fighting long enough, all ends in destruction. Yet this card is not entirely without hope. The Solar influence rules; ruin can never be complete, because disaster is a sthenic disease. As soon as things are bad enough, one begins to build up again. When all the Governments have smashed each other, there still remains the peasant. At the end of Candide's misadventures, he could still cultivate his garden. The Ten of Disks is called Wealth. 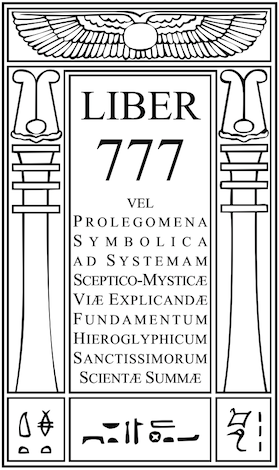 Here again is written this constantly recurring doctrine, that as soon as one gets to the bottom one finds oneself at the top; and Wealth is given to Mercury in Virgo. When wealth accumulates beyond a certain point, it must either become completely inert and cease to be wealth, or call in the aid of intelligence to use it rightly. This must necessarily happen in spheres which have nothing whatever to do with material possessions, as such. In this way, Carnegie establishes a Library, Rockefeller endows Research, simply because there is nothing else to do. But all this doctrine lies behind the card; it is the inner meaning of the card. 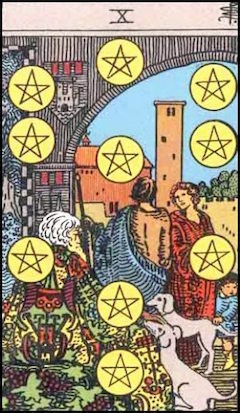 There is another view to consider, that this is the last of all the cards, and therefore represents the sum total of all the work that has been done from the beginning. Therefore, in it is drawn the very figure of the Tree of Life itself. This card, to the other thirty-five small cards, is what the twenty-first Trump, The Universe, is to the rest of the Trumps. The Vision of the Holy Guardian Angel or of Adonai. Has no use. Follow 390 heavens, 18,000 worlds, Earth, Eden and Hell.